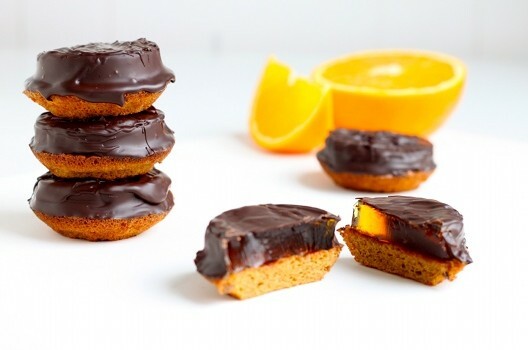 Gluten-Free Primal Jaffa Cakes Macnifique! The other day I had a major hankering for some Jaffa cakes. 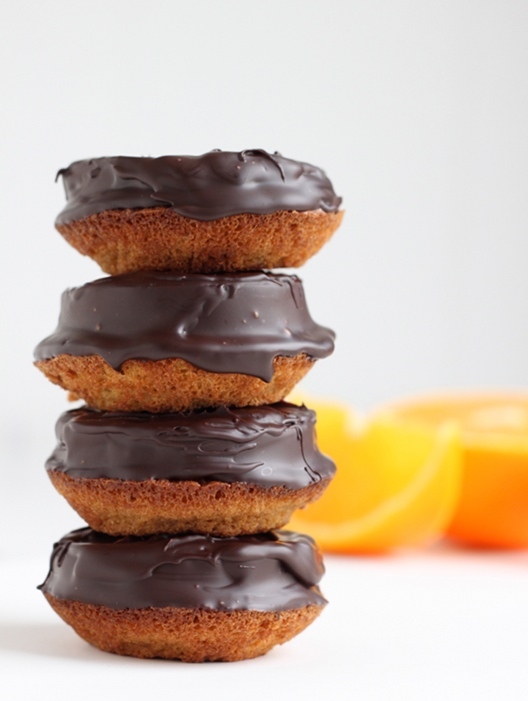 The magical combination of light sponge, zesty orange jelly topped with a coating of dark chocolate. Biting into one is a true sensory experience – as you bite down, your teeth crack through the delicate snap of tempered dark chocolate into the squidgy Jaffa orange jelly, finishing off with a comforting bounce of delicate sponge cake. And the flavours…. well who can argue with the truly exquisite combination of orange and dark chocolate? This snack item is quite deceptive. They are so light and moreish – before you know it – you’ve gobbled up half the pack. And so the only option is to destroy the evidence! 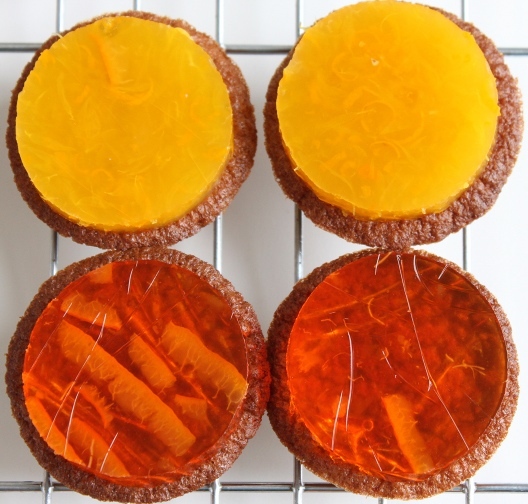 There is another problem with the humble Jaffa Cake. It contains wheat flour (gluten – nasty stuff), refined sugars, and preservatives. We don’t need or want these things in our food. 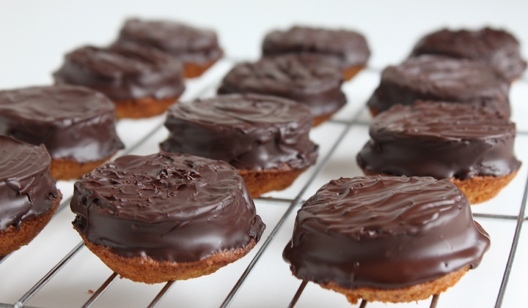 So I took it upon myself to re-invent the Jaffa Cake, making it gluten-free, refined sugar-free and preservative free! These babies are truly epic. You get the same flavour burst and texture combination that makes for a totally immense sensory experience – without any of that yucky business. How did you manage that? – you ask!? Well just take a wee look! Allow this to cool to room temperature before placing in the fridge to set properly. Arrange them on a pretty plate and serve to guests – OR – devour and repeat recipe, then serve! The recipe does look long and a little overwhelming but it’s really not so difficult and it’s worth the effort! It may be wordy but I just wanted to make sure you get all the steps right! If you are just after the gluten-free (and aren’t so worried about the refined sugar) feel free to use the jelly recipe from here to fill your Jaffa cakes. 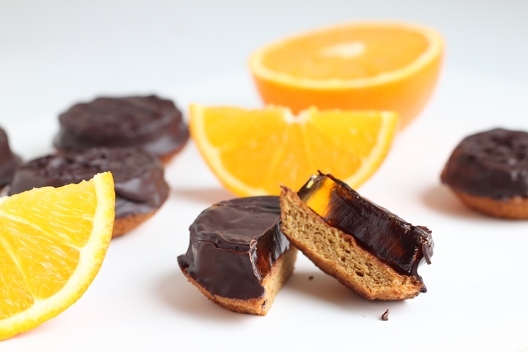 I tested this recipe but actually found that the flavour of the orange jelly using the fresh orange juice produced a more authentic Jaffa cake taste. Hey Ellie! You can buy ground almonds from most supermarkets - check the baking aisle! As for coconut palm sugar your best bet is a health food store. If all else fails use amazon - But you could probably get just as good a result from muscovado sugar which can also be found in your supermarket. The aim really is to use an unrefined sweetener :) let me know how yours turn out! These remind me of a local treat her in Baltimore called Burgers cookies. The cookie base is less spongy, but the frosting is pure dark fudge. They are incredible. These look so wonderful. I can’t wait to make them for Easter! Thank you! Sounds good, but can you give me the US measurements please?